Artificial Intelligence for the Planning Discourse? The discussion about whether and to what extent Artificial Intelligence technology can meaningfully support the planning process with contributions similar or equivalent to human thinking is largely dominated by controversies about what constitutes thinking. An exploration of the reasoning patterns in the various phases of human planning discourse could produce examples for that discussion, leaving the determination of that definition label ‘thinking’ open for the time being. iii) Conditions C are present (or will be, at implementation). Question 1: could such an argument be produced by automated technological means? This question is usually followed up by question 2: Would or could the ‘machine’ doing this be able (or should it be allowed) to also make decisions to accept or reject the plan? Factual Knowledge of the form “F ( C)” or “Conditions C are given”. D(A) <– ((A–> X)|C)) & D(X) & F( C)). It does not seem to be very difficult to develop a Knowledge Base (collection) of such knowledge items and a search-and-match program that would assemble ‘arguments’ of this pattern. Any difficulties arguably would be more related to the task of recognizing and suitably extracting such items (‘translating’ it into the form recognizable to the program) from the human recorded and documented sources of knowledge, than to the mechanics of the search-and-match process itself. Interpretation of meaning: is an item expressed in different words equivalent to other terms that are appropriate to the other potential premises in an argument? “If (FI(A –> X|C) & D(X) & F( C)) then D(A)”. The same cannot as easily be said about question 2. So a ‘search and match’ process as the first part of such a judgment process would have to look for those judgments in the data base, and the difficulty here has to do with where such judgments would come from. The prevailing answers for factual-instrumental premises as well as for fact-premises — premises i) and iii) — are drawing on ‘documented’ and commonly accepted truth, probability, or validity. Differences of opinion about claims drawn from ‘scientific’ and technical work, if any, are decided by a version of ‘majority voting’ — ‘prevailing knowledge’, accepted by the community of scientists or domain experts, ‘settled’ controversies, derived from sufficiently ‘big data’ (“95% of climate scientists…”) can serve as the basis of such judgments. It is often overlooked that the premises of planning arguments, however securely based on ‘past’ measurements, observations etc, are inherently predictions. So any certainty about their past truth must at least be qualified with a somewhat lesser degree of confidence that they will be equally reliably true in future: will the conditions under which the A –> X relationships are assumed to hold, be equally likely to hold in the future? Including the conditions that may be — intentionally or inadvertently — changed as a result of future human activities pursuing different aims than those of the plan? The question becomes even more controversial for the deontic (ought-) premises of the planning arguments. Where do the judgments come from by which their plausibility and importance can be determined? Humans can be asked to express their opinions — and prevalent social conventions consider the freedom to not only express such judgments but to have them given ‘due consideration’ in public decision-making (however roundabout and murky the actual mechanisms for realizing this may be) as a human right. Equally commonly accepted is the principle that machines do not ‘have’ such rights. Thus, any judgment about deontic premises that might be used by a program for evaluating planning arguments would have to be based on information about human judgments that can be found in the data base the program is using. There are areas where this is possible and even plausible. Not only is it prudent to assign a decidedly negative plausibility to deontic claims whose realization contradicts natural laws established by science (and considered still valid…like ‘any being heavier than air can’t fly…’). But there also are human agreements — regulations and laws, and predominant moral codes — that summarily prohibit or mandate certain plans or parts of plans; supported by subsequent arguments to the effect that we all ought not break the law, regardless of our own opinions. This will effectively ‘settle’ some arguments. And there are various approaches in design and planning that seem to aim at finding — or establishing — enough such mandates or prohibitions that, taken together, would make it possible to ‘mechanically’ determine at least whether a plan is ‘admissible’ or not — e.g. for buildings, whether its developer should get a building permit. This pattern is supported in theory by modal logic branches that seek to resolve deontic claims on the basis of ‘true/false’ judgments (that must have been made somewhere by some authority) of ‘obligatory’, ‘prohibited’, ‘permissible’ etc. It can be seen to be extended by at last two different ‘movements’ that must be seen as sidestepping the judgment question. One is the call for society as a whole to adopt (collectively agree upon) moral, ethical codes whose function is equivalent to ‘laws’ — from which the deontic judgment about plans could be derived by mechanically applying the appropriate reasoning steps — invoking ‘Common Good’ mandates supposedly accepted unanimously by everybody. The question whether and how this relates to the principle of granting the ‘right’ of freely holding and happily pursuing one’s own deontic opinions is usually not examined in this context. The relevance of discussing these approaches for the two questions above now becomes clear: If a ‘machine’ (which could of course just be a human, untiringly pedantic bureaucrat assiduously checking plans for adherence to rules or patterns) were able to draw upon a sufficiently comprehensive data base of factual-instrumental knowledge and ‘patterns or rules’, it could conceivably be able to generate solutions. And if the deontic judgments have been inherently attached to those rules, it could claim that no further evaluation (i.e. inconvenient intrusion of differing individual judgments would be necessary. The development of ‘AI’ tools of automated support for planning discourse — will have to make a choice. It could follow this vision of ‘common good’ and valid truth of solution elements, universally accepted by all members of society. Or it could accept the challenge of a view that it either should refrain from intruding on the task of making judgments, or going to the trouble of obtaining those judgments from human participants in the process, before using them in the task of deriving decisions. Depending on which course is followed, I suspect the agenda and tasks of current and further research and development and programming will be very different. This is, in my opinion, a controversial issue of prime significance. Embracing contradictions — A Fog Island Tavern conversation. – Vodçek, tell me, do you have a feeling Abbé Boulah has lost it? – Bog-Hubert, my friend: you do look worried — did you overdo the testing of your new batch of Eau d’Hole? What in the world makes you ask such questions? – Well, I just overheard him talk on the phone with his buddy up in town. Out on the deck while I was coming up the ramp; he didn’t seem to mind at all. And he was going on about how we ought to embrace contradictions, of all things. Speaking Latin and quoting Libbett, whoever that was. – Libbett? Never heard of him. Ah, wait. Libbet’s not a person — at least not one our friend was talking about. Could he have been invoking the old logic rule of “ex contradictione sequitur quodlibet”? – Was that what he kept shouting? What does it mean? – It means “From a contradiction you can infer, conclude whatever”. Right, professor? – Yes indeed. It’s also known as the rule ‘Ex falso quodlibet” It’s a warning about the fallacy of allowing contradictory claims in a system because any statement can be proven from them: anything follows, looking like ‘proof’, even though it’s nonsense. – Okay. Consider a statement (1) “Wine is good for you, or Abbé Boulah is a Lower Lugubrian spy”. Now we know that wine is good for you — even my doctor tells me that, so that statement is true, which means that whole claim is true. But a statement (2) to the effect of ‘Wine is not good for you’ can also be seen as true, since there are wines that are so vile they make you sick. Not in my tavern, of course. But then the fact that if (2) means the first part of statement (1) is not true would mean that its second part must be true, since otherwise the whole sentence would not be true. This ‘proves’ that Abbé Boulah must be a Lower Lugubrian spy. Or whatever you’d put in that second part. – They teach that at la Sorbonne? – Sure do. At least they did when William of Soissons came up with this rule in the 12th century. – But is there even a place called Lower Lugubria? – Right, Renfroe, I mean no. Not yet, at least. But the logic proves it, so it must be true, eh? – Well, I’ll be dipped in Cajun hot sauce. So how come Abbé Boulah can call for anybody to ’embrace’ such nonsense? The government is going to deport him, and where will they send him if there ain’t no such place? – Bears some looking into. Could it be that he means something else by the ‘quodlibet’ thingy? – Interesting idea. Yes, I think he could have meant several things. You know he’s been working with his buddy on the planning discourse support platform idea for a while, where one of the problems has to do with whether there should be an ‘expert system’ or Artificial Intelligence component that could look at both the discussion entries and other data bases, and come up with useful comments to the discourse. And their concern has been, quite reasonably, that the planning discourse contains all kinds of contradictory information. Almost by definition — all the ‘pros and cons’, remember? So how can it draw any meaningful conclusions from all that? – I get it. It’ll all be Lower Lugubrian… So? – So they have been saying that unless the AI folks can come up with a meaningful way of dealing with the contradictions in the discourse — and in the other data bases, too, I’d guess, — there will be big questions about AI support for the planning discourse. – Well, normally, you’d trust whatever such a system comes up with because you think they are trustworthy and reliable — which depends on two things: One, that all the data from which they draw conclusions are true, or at least come with trustworthy probability estimates. And two: that the reasoning rule they use to draw conclusions are ‘valid — meaning that they will actually result in true conclusions if all their premises are true. So if you now admit contradictions in the data gumbo, how can you trust the conclusions? – Well, isn’t the point of such systems to calculate, based on valid reasoning rules and checked-out facts, which of two contradictory claims is true and which one is wrong? – That would be nice, wouldn’t it, Sophie. But it isn’t that easy to tell what’s what. Take the big controversy about climate change, and whether it’s all caused by human activity. There are many studies that show how warming trends seem to follow the amounts of CO2 that human activities emit. Using good, reliable data (meaning the data have been confirmed by other independent studies) and reliable scientific and statistical methods, ‘reasoning’ patterns, if you like. So those studies seem to ‘prove’ that human emissions have contributed to global warming. But there are also studies that use data you can’t dismiss as ‘false’, and equally valid statistical methods — that come up with conclusions that say there is no such connection. – What do you mean, Professor? – Well, Sophie: it turns out that much depends on what kind of data you are using — for example, whether you are measuring temperature changes on the earth’s surface (on land) or over the ocean, or in the ocean, or in the air, and how high up you are measuring it. And it also depends on what time period you are looking at. So each of the studies may actually be quite ‘valid’ in themselves — reliable data and respectable methods — just looking at different data, and coming up with different results. So it takes some close scrutiny to evaluate those studies — the ‘system’ may report all of them as ‘reliable’ because it doesn’t realize that the kinds of data and the time period may make all the difference. So you still need to take a critical look at the studies. – Okay. Let’s not get caught up in that climate issue right now. You mentioned that there were several possible reasons for Abbé Boulah’s strange call? – Yes, thanks for reminding me. At least two, besides simply saying that we need to acknowledge all the contradictions in the discourse, and actively encourage people to express them for discussion and evaluation. Not sweeping them under the rug by pushing for ‘consensus’ or relying on ‘expert’ reports. – Yes. We’ve discussed that — but people seem to be stuck on unified visions and leadership and consensus; well, I guess it takes time to sink in. But you weren’t done yet, were you, sorry? – Sweeping those issues under the rug? Yes. We need different decision tools. – But there still could be more behind Abbé Boulah’s attitude? – Well, maybe he is simply referring to the ‘Systematic Doubt’ method for analyzing a problem and generating solution ideas. – What in ninety nonsequiturs’ names are you talking about, Professor? Here, ~ means negation, ^ means ‘and’ ; v means ‘or’). – So where does the contradiction come in? – Impatient wench, Sophie. Say you have a problem and try to find a way, a plan, to fix it — eliminate it. Now make a statement consisting of several necessary conditions for that problem to exist: “a ^ b ^ c …” (De Morgan’s theorem works for any number of conditions.) You want the problem you want to go away? This can be expressed as ‘~(a^b^c…). The equivalence of that statement to that of ‘ ~a v ~b v ~c…’ means that if only one of those necessary conditions could go away — negated, c o n t r a d i c t e d, get it? — the whole problem would not exist. * Then, you take each of the conditions and negate it: contradict it. Write them out one by one. * Now you look for ways to make these negated statements come true. There may be no way to do that for some statements, but often two or more. They may not all make sense — some can be plain nonsense or hilariously unfeasible, the process can be a lot of fun — but there may just be one or more good ideas for solving the problem, so you can pickup and elaborate on those. You have been nudged to look at the problem from any different viewpoints; improving the chances of finding a good, feasible solution. All by contradicting the necessary conditions for the problem to exist. – So Vodçek, you think this is what Abbé Boulah was talking about? It does make some sense now. – Who knows, Sophie; we may just have to wait until next time he shows up here to ask him about that. But I can think of one more possibility of what he meant. – Oh? As interesting as this Systematic Doubt one? – Well, I’ll let you be the judge of that. It has to do with the meaning of ‘quodlibet’ in that old logic rule. Perhaps the professor can explain it better? – Ah, I think I see what you are getting at, Vodçek. Yes, it would be quite in style with Abbé Boulah’s sometimes, hmm, unusual, way of thinking. Let’s see. ‘Quodlibet’ comes from ‘quod’ , meaning ‘what’, and ‘libet’ means ‘like’ or ‘please’. So maybe wasn’t referring to the meaningless ‘whatever’, random nonsense. He could have been trying to say that by ’embracing the contradictions’ in a planning situation, and using them with some imagination, we could end up with more creative, imaginative, but also pleasing solutions? – As compared to just dwelling on the negative aspects about the problem, the complaints? – Right. You agree, Bog-Hubert? You were the one who heard him talk to his friend — did that sound like it had something to do with Vodçek’s theory? – Well it sure would explain the last comment I heard him say, that I didn’t understand at all at the time. – What was that, again? – Is that what they are saying in Lower Lugubria? – My, Vodçek, you seem to have a great time today – what are you laughing about? – Ah Sophie, did you hear our friends here complaining about the powers that be – the government, the bosses, the tycoons, the media types – all the powerful folks in the world? – Yes, part of it, but then I went outside for a while. What was so funny about it? – Oh, was that the guy who stumbled around the ramp and almost fell into the water getting into his boat? Was he drunk? – Yes, that’s the one. Drunk? He must have been celebrating before he came in, I served him just one beer. No he was a natural obnoxic. – Sounds like you did the right thing. But what did that have to do with their rants about power? – Sure, Renfroe, I totally agree there are problems with power, have been for ages. But our friend Wilford here – was that your friend I had to ask to leave? No? – Our mild-mannered Wilford, of all people, starting to call for immediate overthrow of the government and Wall street and the media tycoons, and throwing all the bankers in jail — that was getting a little too – well déja vu; I just couldn’t take it seriously. Sorry, Wilford. – Okay, okay, Wilford, calm down. We can’t do much from this fogged in-island for now anyway, might as well take a breath and think about it. – Okay – let’s say you are right. So you are organizing a revolution, overthrowing the rascals. Then what? Who’s going to run things? How? – Hmm. Haven’t we heard that before, many times? What I know about history, too many such revolutions have been followed in due course by the rise of another set of powerful people, who began to behave just as badly as the folks they threw in jail – or worse. It’s going on right now! The famous Arab Spring revolutions, only a few years ago – what happened to those? So how would you prevent that? Or first, how do you explain it? – Well, there are always people –- reactionaries – that want to grasp their power back. And of course they must be kept from doing that. – So how are you going to do that? – Well, Sophie, you have to watch them, keep them out of positions where they can get powerful again, keep them from agitating to get the old system back. Stands to reason, doesn’t it? – And because they have been overthrown by force, necessarily, they will assume that if they can assemble some means of force again, they can do the same to the new regime – so you have to make sure that you’ll always have a stronger force available to prevent or put down such attempts … Begins to look very much like the old system all over again, doesn’t it? – We’ll just have to insist on the democratic, legal protections against power abuse – but if the people are in power, why would they start oppressing themselves? – That’s the big question, all right. It has happened too many times: Do we really know enough about that? Would it be useful to take a look at this idea of power, try to understand it better – before we start another bloody mess that results in the same thing, all over again? – You just want us to sit here drinking all night cooking up pipe dreams, don’t you, Vodçek? – Well I never would allow you to use the terms ‘cooking’ in connection with pipe dreams, Bog-Hubert. And I love to have you keep me company in my tavern, yes. But Sophie here looks like she’d like to give that investigation a try, even though she doesn’t even partake of my bodacious Sonoma Zin… How about it, Sophie? – Okay – do you have any ideas where to start? Bog-Hubert? Didn’t you discuss this some time ago with Abbé Boulah? Did anything come of that? – Well now that you mention it, he did have some unusual, almost paradoxical ideas about power. – Huh? Do you remember any of them? – Vaguely. It was a dark and stormy night, you know… Well, one part I remember was that he thought the need or desire for power is something almost like a human right. – You are kidding, aren’t you? Abbé Boulah said that? – Yes. Well, the way Wilford puts it, isn’t he saying the same thing – just from the lower end up? Empowerment! Power to the people! Freedom means being empowered to do things of your choice, not some bosses or superior’s choice. And you have to be ‘empowered’, have the power, possibility and resources, to do that. – Oh. Put like that, it almost makes sense. But that isn’t the kind of power we are fighting, is it? – No, Sophie, but the distinction isn’t always clear enough. What you are worried about is when having power to do things starts to include telling other people what you want them to do. And some of those are even what we want and agree with? – You’ve got to explain that, Bog-Hubert. – I’ll try. See, when it comes to things we’d like to do that could affect other people, we sort of agree that the democratic way to deal with that is to talk about it. To turn ‘my plan’ and ‘your plan’ into ‘our plan’ that we both can endorse and support. And the ‘leave our guns outside, sit down and talk’ part, the old parliamentary principle, that’s is what we are trying to improve upon. To make sure the decisions are really based on the merit of what we are talking about – not just overriding half of it with a majority vote. That’s an important task, isn’t it? Especially now that we are faced with increasingly ‘global’ decisions. – What do you mean by ‘global decisions’? – Well, take the example of the rules of the road, or oceans, or international flying conventions. Travel and trade rules and conventions. Some are arbitrary – like, do we drive on the right or left side of the road? But we have to have some agreement about that. – I see, makes sense. And more complex decisions will take some talking, and better decision-making methods. Okay. – Yes. But then there are situations for which we need decisions that can’t wait for a long participatory discussion process. On a ship in the ocean that’s suddenly encountering an iceberg, somebody has to make a quick decision whether to pass it to the port or starboard, or stop and back up. That’s what we need the captain for. People in a position of empowerment — power — to make such decisions, on our behalf. And have everybody go along with all the actions needed to carry out the commands. – Ah, I see what you mean: these are power decisions we expect the captain to make. — And of course he wants to be a captain, wants to be able to make such decisions: they are more significant, more important, than if he were alone in a dinghy to make his own decision. – Right. And hasn’t history shown that it’s precisely those kinds of decisions that are the source of the trouble? They are, in principle, ‘legitimate’ – we expect them to be made for us. But we know they are also addictive. People in such positions of power want more and more ‘responsibility’, for more and more important decisions. Getting power-drunk. Empowerment and freedom – becoming fatally intertwined. – ‘Fatally’ – sounds ominous. Aren’t there rules, provisions, to keep such decisions ‘legitimate’, orderly? – Sure; humanity has invented a number of tricks to keep that under control. One of the tricks is the hierarchical organization – of governments and businesses, armies etc. At each level, a person is ‘subordinate’ to the rules and oversight – and directions – from the level above him or her – but has considerable freedom to decide things for the levels below. A kind of control, you agree? – Yes, Renfroe. And for the highest level… Which is where things become dangerous – in spite of the so-called safeguards against abuse that have been invented for modern governments: elections, time limits, impeachment provisions made possible by sophisticated ‘balance’ of powers of different government branches. Those things are the best we have, but they still don’t seem to work well enough anymore. – Well, there are several reasons why things get mucked up. One is the feature of ‘enforcement’. You made your laws, agreements, according to the clean democratic rules. But then you have to make sure that everybody actually follows and adheres to those rules. Which is why we have ‘enforcement’ institutions – police. The word itself – enforcement — indicates the poverty of the thing: we apparently can’t think of any way of making sure the laws are followed than by threaten violators with force or coercive consequences, and pursuing violators with necessarily greater force and power than any would-be violator. Otherwise it won’t work, right? – Hmm. I see where you are going. Now you have an enforcement agency with considerable power – and no greater power to keep it from falling victim to temptations of abusing their power. So the sheriff – who knows that even the mayor has been recklessly exceeding the speed limit, perhaps even under, shall we say, some influence… but has not taken any enforcement action against Hizzonner, in return for perhaps some generous provisions in next years budget. I know; shocking, shocking. Some forms of power that aren’t on the books. Not even talking about campaign contributions by businesses subject to city regulations… You said there were several such snakes in the grass? The private sector gaining some undue control over government being one? – You said it. Campaign contributions buying elections, the story is getting old. Another is the military. Sure, we need it, to defend our dear country against all those bad enemies – it must have bigger, badder weapons that anybody else, and nobody bigger to keep it from, well, losing some billions here and there in the fog of war exercises… Now think: any wonder that so many countries end up with a military takeover after a ‘revolution’ or other government screw-up? – You are beginning to really scare us here, Bog-Hubert. Enough to make us believe that a revolution might be necessary after all – if we weren’t too scared of the remedy too. So Abbé Boulah and you, and that buddy of yours up in town, you have no better ideas for how to deal with this? Stormy night not stormy enough for more productive brainstorm? – Would we be sitting here having to ask Vodçek to get rid of troublemakers if we did? Well, maybe there are some ideas that could at least improve things a little. The power thing is too engrained to be fixed with one kind of magic stroke. – I remember now – it has to do with that planning discourse platform you guys keep harping on? The kind of discourse contribution reward points you want to give people for meaningful information they enter into the discussion? – Good guess, Sophie. Yes, it turns out that there are a few, you might say, ‘collateral’ effects of that platform that could be turned into a kind of control of power. – Okay, enlighten us. I know you talked about that before, but not in connection with the power issue, as I remember it. – Yes. Well, the basic idea behind that discourse platform is of course to find a better way to connect the final decisions with the merit of the contributions – the questions, ideas and proposals, arguments, and other information people bring into the discussion to be given ‘due consideration’. Actually, if we could achieve just that much, it might lessen the problem that decisions achieved by plain majority voting might be based on entirely different motivations than the sanctimonious promises made by officials in the discussion. – But do you really need those contribution points for that? – I think so. In order to develop any ‘measure’ of contribution merit, you have to have something to measure, some entity you ‘count’ and some way to indicate how meritorious that items is. So the first thing we need is some ‘point’ that identifies an original contribution to the discourse hat a participant has made. At first, it’s ‘neutral’ or ‘empty’ – just indicates how many entries a person has made. Good or bad, silly or profound. But later, in the process of evaluating plausibility and importance of that item, that point becomes ‘plausible’ and significant (in the assessment of other participants) or ‘implausible’, without merit, if it turns out to be false, insufficiently supported by further evidence or reasoning. – I remember that, yes. So how does that help control power? – Patience. So each participant ends up with an ‘account’ of contribution merit points. Participating in many public projects, over time, that account can become a meaningful indicator of the overall merit of the person’s contribution to public issues. It might become a valuable part of a person’s qualification for public office: an indication of the person’s commitment to public welfare as well as reliable judgment about such issues. Wouldn’t you want the official, the captain, to be able to make sound judgments – especially if they have to be made in a hurry? So that account would be another way to get people of good sound judgment into public office. – That isn’t a guarantee yet, that good people won’t fall victim to power temptations though, is it? – No, or not really enough. Though maybe good judgment may make them less vulnerable? Anyway: here’s where Abbé Boulah makes a real leap. He says: If the need or desire for power is an actual, even legitimate human need, like food, clothing, housing etc. – why shouldn’t it be treated like one of those needs? – What do you mean – treated like one of those needs? – Well, what do you have to do to get food, housing? You pay for it. So Abbé Boulah says: let people ‘pay’ for power decisions. But of course you can’t use money as the currency for that, since money hasn’t always been ‘earned’ in quite the same way. So you use the credit point account. Each power decision will require a ‘credit point payment’. If you used up your points, no more power. I’m sure we can devise the technology for implementing that: any power decision will be ‘signed’ only with the appropriate amount of credit points. – Wait: some officials may have to make decisions that require many more credit points than anybody can have earned in a private account? What about those? – Good point: If you support an official and want her to be able to make such important decisions, why not transfer some of your own credit points to her account? You can perhaps even specify the precise decisions for which you designate your contribution. That way, you too, become ‘accountable’ for that decision, using y o u r ‘power’ credit to actually influence decisions. But then you are using up your power credits just like the official. – Shouldn’t we also be able to withdraw our credit points support from an official who is making some decisions you do not support? – Good point, Vodçek. Now ‘power to the people’ actually begins to mean something? – But there must be also be a way to ‘earn’ credits back for having made successful decisions? A ‘return on credit’ investment? – If I remember correctly, wasn’t there some other mechanism having to do with power, that was somehow connected to this whole scheme? – Yes. It was Abbé Boulah’s rant about learning from mistakes. It may not be connected to the credit points idea though, if I remember correctly. – Who wouldn’t have a good time celebrating brilliant ideas? – Well, what was the idea? – It had to do with the fear factor, Sophie. Remember how we said that people make mistakes, and then feel compelled to cover up those mistakes, by shady means, which makes them vulnerable to criticism and unpleasant consequences if they admit to having made them, — if mistakes are ‘punished’ as they usually are. And it’s that fear that escalates the improper use of power to avoid and evade the consequences. Now Abbé Boulah also thought that this was a great loss of a very different kind: the opportunity to learn from mistakes – both our own and others. So he suggested it might be a good idea to reward people who have made mistakes – at least by not punishing them – if they would admit the mistake and give a cogent explanation of what went wrong, what miscalculations were made, — as a kind of valuable discourse contribution. And in the process remove some of the fear – of discovery, of being blamed, and punished for mistakes. The fear of the powerful that now drives many to improper uses of power. – Mercy on the powerful? That’s a lot of powerful stuff to think about, Bog-Hubert. So what are you going to do about it? The following are suggestions for an experimental application of a ‘pilot’ version of the structured planning discourse platform that should be developed for planning projects with wide public participation, at scales ranging from local issues to global projects. The eventual ‘global’ platform will require research, development and integrated programming features that current social media platforms do not yet offer. The ‘pilot’ project is aiming at producing adequate material to guide further work and attract support and funding a limited ‘pilot’ version of the eventual platform, that can be run on currently available platforms. One of the key aims of the overall project is the development of a planning process leading to decisions based on the assessed merit of participants’ contributions to the discourse. The procedural provisions for realizing that aim are precisely those that are not supported by current platforms, and will have to be implemented as optional add-on processes (‘special techniques’) by smaller teams, outside of the main discourse. Therefore, the proposal is presented as a set of three optional ‘levels’ of depth of analysis and evaluation. Actual projects may choose the appropriate level inconsideration of the project’s complexity and importance, of the degree of consensus or controversy emerging during the discourse, and the team’s familiarity with the entire approach and the techniques involved. Assuming a venue like Facebook, a new ‘group’ page will be opened for the experiment. It will serve as a forum to discuss the approach and platform provisions, and to propose and select ‘projects’ for discussion under the agreed-upon procedures. For each selected project, a new group page will be opened to ensure sufficient hierarchical organization options within the project. There will be specific designated threads within each group, providing the basic structure of each discourse. A key feature not seen in social media discussions is the ‘Next step’ interruption of the process, in which participants can choose between several options of continuing or ending the process. ‘Participants’ in projects will be selected from the number of ‘group members’ having signed up, expressing an interest in participating, and agree to proceed according to the procedural agreements for the project. The basic process of project discourse is the same for all three levels; the argument plausibility assessment and project quality assessment procedures are easily added to the simple sequence of steps of the ‘basic’ versions described in section 2. In previous drafts of the proposal, these assessment tools have been described as ‘special techniques’ that would require provisions of formatting, programming and calculation. For any pilot version, they would have to be conducted by ‘special teams’ outside of the main discourse process. This also applies to the proposed three-level versions and the two additional ‘levels’ of assessment presented here. Smaller ‘special techniques teams’ will have to be designated to work outside of the main group discussion, (e.g. by email); they will report their results back to the main project group for consideration and discussion. For the first implementation of the pilot experiment, only two such special techniques: the technique of argument plausibility assessment, and the evaluation process for plan proposal ‘quality’ (‘goodness’) are considered; they are seen as key components of the effort to link decisions to the merit of discourse contributions. Project selection Group members post suggestions for projects (‘project candidates) on the group’s main ‘bulletin board’. If a candidate is selected, the posting member will act as its ‘facilitator’ or co-facilitator. Selection is done by posting an agreed-upon minimum of ‘likes’ for a project candidate. By posting a ‘like’, group members signal their intention to become ‘project participants’ and actively contribute to the discussion. For selected projects, a new page serving as introduction and ‘bulletin board’ for the project will be opened. It will contain a description of the project (which will be updated as modifications are agreed upon). For the first pilot exercise, the projects should be an actual plan or action proposals. On a separate thread, a ‘default’ version of procedural agreements will be posted. They may be modified in response to project conditions and expected level of depth, ideally before the discussion starts. The agreements will specify the selection criteria for issues, and the decision modes for reaching recommendations or decisions on the project proposals. (See section 5 for a default set of agreements). A ‘General discussion’ thread will be started for the project, inviting comments from all group members. For this thread, there are no special format expectation other than general ‘netiquette’. On a ‘bulletin board’ subthread of the project intro thread, participants can propose ‘issue’ or ‘thread’ candidates, about questions or issues that emerge as needing discussion in the ‘general discussion’ thread. Selection will be based on an agreed-upon number of ‘likes, ‘dislikes’ or comments about the respective issue in the ‘general discussion’ thread. Issue threads: For each selected issue, a separate issue thread will be opened. The questions or claims of issue threads should be stated more specifically in the expectation of clear answers or arguments, and comments should meet those expectations. Comments containing links and references should provide brief explanations about what positions the link addresses or supports; the links should also be posted on a ‘links and references’ thread. Comments can be accompanied by diagrams, maps, photos, or other visual material. Comments should briefly explain the gist of the message supported by the picture. (“What is the ‘argument’ of the image?) For complex discussions, overview ‘maps’ of the evolving network of issues should be posted on the project ‘bulletin’ thread. – dropping the issue, ending the discussion without decision. These will be decided upon according to the procedural rules ‘currently’ in force. The decision about the proposed plan — or partial decisions about features that should be part of the plan — will be posted on the project’s ‘bulletin board’ thread., together with a brief report. Reports about the process experience, problems and successes, etc. will be of special interest for further development of the tool. The sequence of steps for the discourse with added argument plausibility assessment is the same as those of the ‘basic’ process described in section 2 above. At each major step, participants can make interim judgments about the plausibility of the proposed plan, (for comparison with later, more deliberated judgments). At each of these steps, there also exists the option of responding to a ‘Next step?’ motion with a decision to cut the process short, based on emerging consensus or other insights such as ‘wrong question’ that suggest dropping the issue. Without these intermediate judgments, the sequence of steps will proceed to construct an overall judgment of proposal plausibility ‘bottom-up-fashion’ from the plausibility judgments of individual argument premises. The proposal for which the argument assessment is called, is presented and described in as much detail as is available. Participants assign ‘weights of relative importance’ w to the deontics in list (a), such that 0 ≤ wi ≤ 1, and ∑wi = 1, for all i arguments. For each participant and argument, the ‘Argument plausibility’ Argpl is calculated from the premises plausibility judgments. E,g. Argplod = ∏ (premplj) for all j premises of the argument. From the argument plausibility judgment s and the weight of the deontic premise for that argument, the ‘weight of the respective argument Argw is calculated. E.g. Argwi = Argplod * wi. 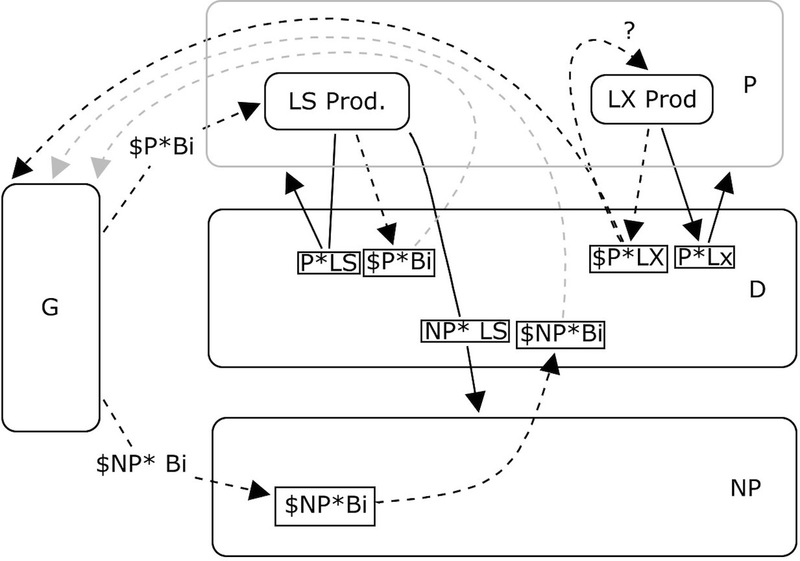 The Argument weights Argw of all arguments pro and con are aggregated into the deliberated plan plausibility score Planplod for each participant. E.g. Planpld = ∑(Argwi) for all i arguments. Statistics of the Plan plausibility judgment scores across the group (Mean, Median, Range, Min /Max) are calculated and discussed. Areas of emerging consensus are identified, as well as areas of disagreements of lack of adequate information. The interim judgments designated as ‘optional’ above can serve to illustrate the learning process participants go through. The argument assessment team reports its findings and analysis, makes recommendations to the entire group in a ‘Next Step?’ deliberation. Because pro / con arguments usually refer to the deontic concerns (goals, objectives) in qualitative terms, they do not generally generate adequate information about the actual quality or ‘goodness’ that may be achieved by a plan proposal. A more fine-grain assessment is especially important for the comparison of several proposed plan alternatives. It should be obvious that all predictions about the future performance of plans will be subject to the plausibility qualifications examined in section 3 above. So a goodness or quality assessment may be grafted onto the respective steps of the argument plausibility assessment. The following steps describe one version of the resulting process. (Optional step:) Upon presentation of a proposal, participants can offer a first overall offhand goodness or quality judgment PlanQoo, e.g. on a +3 / -3 scale, for future comparison with deliberated results. From the pro / con arguments compiled in the argument assessment process (section 3) the goals, concerns (deontic premises) are assembled. These represent ‘goodness evaluation aspects’ against which competing plans will be evaluated. Participants may want to add other ‘standard’ as well as situation-specific aspects that may not have been mentioned in the discussion. (There is no guarantee that all concerns that influence participants’ sense of quality of a plan will actually be brought up and made explicit in a discussion). For all aspects, ‘measures of performance’ will be determined that allow assessment about how well a plan will have met the goal or concern. These may be ‘objective’ criteria or more subjective distinctions. For some criteria, ‘criterion functions’ can show how a person’s ‘quality’ score depends on the corresponding criterion. ‘so/so’, or acceptable, than participant o. $0 | | | | | | | | | > Cost criterion function. “Weighting’ of aspects, subaspects etc. The ‘weight’ assignments of aspects (deontics) should correspond to the weighting of deontic premises in the process of argument assessment. However, if more aspects have been added to the aspect list, the ‘weighting’ established in the argument assessment process must be revised: Aspects weights are on a zero to +1 scale, 0 ≤ w ≤ 1 and ∑wi = +1 for all i aspects. For complex plans, the aspect list may have several ‘levels’ and resemble an ‘aspect tree’. The weighing at each level should follow the same rule of 0 ≤ w ≤ 1 and ∑w=1. Each participant will assign ‘quality’ or ‘goodness’ judgments, on a +3 to -3 scale (+3 meaning ‘could not possibly be better’, -3 ‘couldn’t possibly be worse’, with zero (0) meaning ‘so-so’ or ‘can’t decide’, not applicable) to all aspects / subaspects of the evaluation worksheet, for all competing plan proposals. Each (partial) quality score q will be combined with the respective argument plausibility score Argpl from the process in section 3, resulting in a ‘weighted plausibility-adjusted quality score’ Argqplwi = Argpli * qi * wi . Like the statistics of the plausibility assessments, statistical analysis of these these scores can be calculated. Whether a resulting measure such as Mean (PlanQ) should be accepted as a ‘group judgment’ is questionable, but such measures can become helpful guides for any decisions the group will have to make. Again, calculation of interim results can provide information about the ‘learning process of team members, ‘weaknesses’ of plans that are responsible for specific poor judgment scores, and guide suggestions for plan improvements. A team report should be prepared for presentation back to the main discussion. The proposed platform aims at facilitating problem-solving, planning, design, policy-making discussions that are expected to result in some form of decision or recommendation to adopt plans for action. To achieve decisions in groups, it is necessary to have some basic agreements as to how those decisions will be determined. Traditional decision modes such as voting are not appropriate for any large asynchronous online process with wide but unspecified participation (Parties affected by proposed plans may be located across traditional voting eligibility boundaries; who are ‘legitimate’ voters?). The proposed approach aims at examining how decisions might be based on the quality of content contributions to the discourse rather than the mere number of voters or supporters. The following are proposed ‘default’ agreements; they should be confirmed (or adapted to circumstances) at the outset of a discourse. Later changes should be avoided as much as possible; ‘motions’ for such changes can be made as part of a ‘Next step’ pause in the discussion; they will be decided upon by a agreed upon majority of participants having ‘enlisted’ for the project, or agreements ‘currently’ in place. Members of the Planning Discourse FB group (Group members) can propose ‘projects’ for discussion on the Main group’s ‘Bulletin Board’ Thread. Authors of group project proposals are assumed to moderate / facilitate the process for that project. Projects are approved for discussion if an appropriate number __ of group members ‘sign up for ‘participation’ in the project. Project participants are assumed to have read and agreed to these agreements, and expressed willingness to engage in sustained participation. The moderator may choose to limit the number of project participants, to keep the work manageable. Project discussion can be ‘started’ with a Problem Statement, a Plan Proposal, or a general question or issue. The project will be briefly described in the first thread. Another thread labeled ‘Project (or issue) ___ General comments’ will then be set up, for comment on the topic or issue with questions of explanation clarification, re-phrasing, answers, arguments and suggestions for decisions. Links or references should be accompanied by a brief statement of the answer or argument made or supported by the reference. Participants and moderator can suggest candidate issues: potentially controversial questions about which divergent positions and opinions exist or are expected, that should be clarified or settled before a decision is made. These will be listed in the project introduction thread as Candidate Issues. There, participants can enter ‘Likes’ to indicate whether they consider it necessary to ‘raise’ the issue for a detailed discussion. Likely issue candidates are questions about which members have posted significantly different positions in the ‘General comments’ thread; such that the nature of the eventual plan would significantly change depending on which positions are adopted. Issue Candidates receiving an agreed upon number of support (likes, or opposing comments, are accepted and labeled as ‘Raised’. Each ‘raised’ issue will then become the subject of a separate thread, where participants post comments (answers, arguments, questions) to that issue. ‘Yes, because A will bring about B given conditions C , B ought to be pursued, and conditions C are present’). At any time after the discussion has produced some entries, participants or moderator can request a ‘Next Step?’ interruption of the discussion, for example when the flow of comments seems to have dried up and a decision or a more systematic treatment of analysis or evaluation is called for. The ‘Next step’ call should specify the type of next step requested. It will be decided by getting agreed-upon number of ‘likes’ of the total number of participants. A ‘failed’ next step motion will automatically activate the motion of continuing the discussion. Failing that motion or subsequent lack of new posts will end discussion of that issue or project. Decisions (to adopt or reject a plan or proposition) are ‘settled’ by an agreed-upon decision criterion (e.g. vote percentage) total number of participants. The outcome of decisions of ‘next step?’ motions will be recorded in the Introduction thread as Results, whether they lead to an adoption, modification, rejection of the proposed measure or not. The controversial aspect of all these ‘group scores is the method for deriving these from the respective individual scores. These measures also provide the opportunity for measuring the degree of improvement achieved by a proposed plan over the ‘initial’ problem situation a plan is expected to remedy: leading to possible decision rules such as that rejecting plans that do not achieve adequate improvement for some participants (people being ‘worse off ‘after plan implementation) or selecting plans that achieve the greatest degree of improvement overall. This of course requires that the existing situation be included in the assessment, as the basis for comparison. In the ‘basic’ version of the process, no special analysis, solution development, or evaluation procedures are provided, mainly because the FB platform does not easily accommodate the formatting needed. The goal of preparing decisions or recommendations based on contribution merit or assessed quality of solutions may make it necessary to include such tools – especially more systematic evaluation than just reviewing pro and con arguments. If such techniques are called for in a ‘Next step?’ motion, special technique teams must be formed to carry out the work involved and report the result back to the group, followed by a ‘next step’ consideration. The techniques of systematic argument assessment (see section 3) and evaluation of solution ‘goodness’ or ‘quality’ (section 4) are shown as essential tools to achieve decisions based on the merit of discourse contributions above. Special techniques teams will have to be designated to work on these tasks ‘outside’ of the main discourse; they should be limited to small size, and will require somewhat more special engagement than the regular project participation. For the smaller groups likely to be involved in ‘pilot’ applications of the proposed structured discourse ideas described, traditional decision modes such as ‘consensus’, ‘no objection’ to decision motion, or majority voting may well be acceptable because familiar tools. For large scale planning projects spanning many ordinary ‘jurisdictions’ (deriving the legitimacy of decisions from the number of legitimate ‘residents, these modes become meaningless. This calls for different decision modes and criteria: an urgent task that has not received sufficient attention. The following summary only mentions traditional modes for comparison without going into details of their respective merit or demerits, but explores potential decision criteria that are derived from the assessment processes of argument and proposal plausibility, or evaluation of proposal quality, above. Proposals receiving an agreed-upon percentage of approval votes from the body of ‘legitimate’ voters. The approval percentages can range from simple majority, to specified plurality or supermajority such as 2/3 or 3/4 to full ‘consensus’ (which means that a lone dissenter has the equivalent of veto power.) Variations: voting by designated bodies of representatives, determined by elections, or by appointment based on qualifications of training, expertise, etc. Decision based on meeting (minimum) qualification rules and regulations. Plans for building projects will traditionally receive ‘approval’ upon review of whether they meet standard ‘regulations’ specified by law. Regulations describe ‘minimum’ expectations mandated by public safety concerns or zoning conventions but don’t address other ‘quality’ concerns. They will lead to ‘automatic’ rejection (e.g. of a building permit application) if only one regulation is not met. Decision-making groups can decide to select plans based on assessed or calculated ‘performance’. Thus, real estate developers look for plan versions that promise a high return on investment ratio (over a specified) ‘planning horizon’. A well known approach for public projects is the ‘Benefit/Cost’ approach calculating the Benefit minus Cost (B-C) or Benefit-Cost ration B/C (and variations thereof). The argument assessment approach described in section 3 results in (individual) measures of proposal plausibility. For the individual, the resulting proposal plausibility could meaningfully serve as a decision guide: a proposal can be accepted if its plausibility exceeds a certain threshold – e.g. the ‘so-so’-value of ‘zero’ or the plausibility value of the existing situation or ‘do nothing’ option. For a set of competing proposals: select the one with the highest plausibility. It is tempting but controversial to use statistical aggregation of these pl-measures as group decision criteria; for example, the Mean group plausibility value GPlanpld. For various reasons, (e.g. the issue of overriding minority concerns), this should be resisted. A better approach would be to develop a measure of improvement of pl-conditions for all parties compared to the existing condition, with the proviso that plans resulting in ‘negative improvement’ should be rejected (or modified until showing improvement for all affected parties). Similar considerations apply to the measures derived from the approach to evaluate plans for ‘goodness or ‘quality’ but adjust the implied performance claims with the plausibility assessments. The resulting group statistics, again, can guide(but should not in their pure form determine) decisions, especially efforts to modify proposals to achieve better results for all affected parties (the interim results pinpointing the specific areas of potential improvement. The proposal to offer reward points for discourse contributions is strongly suggested for the eventual overall platform but one difficult to implement in the pilot versions (without resorting to additional work and accounting means ‘outside’ of the main discussion). Its potential ‘side benefits’ deserve some consideration even for the ‘pilot’ version. Participants are awarded ‘basic contribution points’ for entries to the discussion, provided that they are ‘new’ (to the respective discussion) and no mere repetition of entries offering essentially the same content that have already been made. If the discussion later uses assessment methods such as the argument plausibility evaluation, these basic ‘neutral’ credits are then modified by the group’s plausibility or importance assessment results – for example, by simply multiplying the basic credit point (e.g. ‘1’) with the group’s pl-assessment of that claim. – for speedy assembly of needed information (since delayed entries of the same content will not get credit). – Sincere participants will be encouraged to provide adequate support for their claims. Together with the increased discipline introduced by the assessment exercises, his can help improve the overall quality of discourse. * Say, Vodçek, esteemed keeper of this fine Tavern: where’s your prime regular Abbé Boulah? I haven’t seen him here for some time? – I’m not sure, Bog-Hubert — but I have a feeling he’s out on this place in the ocean again. This new refugee community on that old oil rig — Rigatopia or whatever they call it. They keep trying new governance schemes out there, and Abbé Boulah seems to take an intense interest in what they are doing, if he’s not actually the one cooking up those things himself. I thought you knew more about that than what I can pick up here while I’m washing cups and glasses? * You’re right, he often runs his ideas by me when we’re out fishing, or when he’s checking out my latest batch of Eau d’Hole in my swamp refuge — but every once in a while he just gets a new idea and takes off… Hi, Sophie — did you get a sense of what he’s up to this time? + No, sorry. But last time I was here, there was a guy who was trying to gather information about one of those Rigatopian ideas — a journalist, or perhaps some government snoop wondering if they are planning to invade the mainland. That was about some new kind of ‘civic credit’ scheme saving democracy or controlling power, I didn’t really understand it since I was there on the other end of the bar having an argument with Renfroe about protecting the sea turtles nesting here on the island. I wanted to join them to find out how all those issues fit together, but you know Renfroe, he just wouldn’t quit. Turtles all the way down to final call. Do you know any of that civic credit scheme, Bog-Hubert? * Oh yes, they’ve been trying different versions of that idea for some time. I guess it gets confusing because they are trying to use it for so many different aims. Some just see it as an important part of their ‘planning discourse’ support scheme, getting people to contribute important information about a problem or plan, but not clogging the record just repeating the same points over and over. Others see it as the main tool for getting to decisions that are based on the merit of all that information. And then there are those who are most interested in how this scheme can help control power — at least they seem to think it can. To get the whole picture, you have to understand how it relates to their way of running public planning discussions. + Can you give us a sense of what it’s all about? * I can try. Vodçek, can you get that air out of my glass here? I may need some more sustenance fuel to get through the whole thing. – Sure. Sonoma Zin, right? * Yes. Thanks. Okay. Let’s start with their planning discourse. They are trying to involve all their citizens in a discussion about important problems and issues out there, to arrive at decisions that everybody or most people can support because they had a chance to voice their opinions, develop and contribute ideas, and have all of those concerns given ‘due consideration’. Ideally, ending up with everybody being comfortable with the outcome. Even if those clean all around ‘win-win’ solutions are hard to achieve. + You can say that again. So? * Okay. They want to encourage everybody who has something to say about a plan to actually bring it up, to enter it into the discussion. Questions, ideas, information about the situation, concerns, arguments pro and con. Participation. So they offer ‘contribution credits points’ for all such entries. * I know what you are saying: you’ll get flooded with all kinds of repetitious garbage? No; they handle that by making sure you get the point for an entry only if it’s the first of that information content; repetitions don’t get the credit. – Ah, clever move: It encourages people to hurry up to get their information in, — it speeds up things, and also keeps the record from getting clogged up with all the repetitious stuff. Right? * Right, Vodçek. You don’t think so, Commissioner? = How do they decide whether a piece of information is repetitive — that it is essentially the same as another one that has been entered already? Because they may be worded differently and don’t sound the same at all? Is there a machine that does that automatically? * I guess there are ‘artificial intelligence’ programs that can do that — you’ll have to ask our digital friend Dexter about that — but in a small project where there aren’t too many participants, you can ask the people involved: ‘Hey, aren’t you both talking about the same thing? If their explanation about what their entry ‘means’ uses the same information, it’s likely the same; if not, okay, it’s a separate, different aspect. – How do you reassure people that those points that have been entered — that can’t be repeated to make sure they’ll be considered — will actually b e given due consideration? * Good question. It requires that in getting to the decision, there will be a process that transparently guarantees that all entries will factor into the decision judgments. This means that each item must be evaluated and given some measure of significance — plausibility and importance –, and then combined into some measure of performance of the overall issue to be decided. For example, for a proposed plan, all the ‘pro and con’ judgments people have been raising will be merged into an overall plausibility measure. – Yes: We’ve been talking about that before: Abbé Boulah’s buddy has developed a technique for doing that. It may not be the ultimate solution, but it shows that such a process is possible. The point is that all contributions to the discussion — all arguments and their premises — must be ‘evaluated’. They won’t all have the same ‘merit’, right? * Precisely. Some arguments may have a flawed — fallacious — structure; some premises may not be true or plausible; they may not have sufficient supporting evidence or further arguments. We don’t have to go into detail about the details or possible variations of that process here: the outcome is that all entered information items that will be considered in reaching the decision must be given some merit score in that process. A basic claim ends up being given a ‘positive’ score if has been judged to be plausible, sufficiently well supported, or ‘negative’ if it turns out to rest on false or unsupported premises. = Sounds complicated. But tell me: Who decides that? * Ah, another good question. You are putting the finger on the problem that people have very different opinions about whether a piece of information has merit or not — is ‘true’ or ‘probable’ or ‘plausible’. + Isn’t the idea of the discourse that we hope to straighten outmost of the tricky differences? That the arguments and the evidence people offer to support them will ‘settle’ the issues, that people will end up agreeing on the ‘truth’? * Sure, Sophie: ideally. That’s the idea behind the grand old parliamentary principle: let’s leave our Uzis outside, let’s talk, try to explain our concerns to each other, and together find the right answer. But the reality is that just as each plan will have ‘costs’ as well as ‘benefits’, a consequence of implementing a plan that is seen as a benefit by some will end up being seen as a ‘cost’ to those who are expected to endure or pay for it. – So all participants will still end up with their own judgments about each argument and premise? * Yes. And the question of how to put them all together is always and inevitably a controversial issue that must be agreed upon. Now it’s becoming obvious that the current predominant method for reaching a decision — majority voting — is precisely NOT living up to the aim of getting a decision based on the merit of the information and reasons contributed” the information and concerns of the minority is utterly ignored and discarded. – I understand Abbé Boulah and his Rigatopians are looking for different ways of making decisions that have a closer and more transparent link between discussion merit and decision? That is a truly important work in progress, but it’s a different issue than Sophie’s question about the credit points, isn’t it? Can we get back to that one? * Okay. It was just necessary to put that question into the context of the whole discourse process. Well, there may be different ways of getting to an assessment of the merit of the information items that people contribute to the discourse. But the upshot is that each contribution by a person, that has now been evaluated — by the whole group of participants, or a separate task force that will devote the necessary time and effort to do that — all those merit scores of the contributions a person has made to the project can be added up into a kind of ‘civic credit’ account for that person. + So? What good will that do? What are those points good for? * That is the beauty of the idea: — yes, the account is useless and a waste of time unless it’s a game and you can boast of your credit score — but you are right: The credits have to be fungible — you’ll have to be able to exchange them for something. So how about adding them to your resume, as an added qualification aspect for jobs? Especially if you are applying for a job where you have to make decisions on behalf of the public — remember, there are many such positions where decisions have to be made that can’t wait for a lengthy public discussion. So perhaps it’s useful to have some evidence of the kind of judgment you will bring to such tasks: If your account shows a lot of entries that have gotten high merit scores (say, a ratio between total merit scores and the number of entries you made), would we be more confident that you’ll make good decisions than if you have a record of a lot of entries but a negative overall credit tally? Or no such credits at all? + Hmm. That may be a good basis for electing people to public office, do you think? * Abbé Boulah couldn’t have said it better! And that idea can still be extended into some ‘unexpected corollary benefit’ opportunities. = Huh? Not just those ‘unexpected consequences’ — usually of the unpleasant kind? Do explain. * Well, how about two possibilities. Connected, related possibilities. One is the idea of requiring people in such ‘power decision positions’ to ‘pay’ for such decisions. With credit points. = Oh boy. Paying for doing the job they were elected or appointed to do? * I knew that one would get your attention, Commissioner. Don’t worry though: not with money, with credit points. Consider: Part of the reason people want to get elected or appointed to such exalted positions is because they want power. Isn’t the desire for power almost something like a human ‘need’? Or ‘right’? If you are campaigning with and for the ‘downtrodden’, what are they asking for? Empowerment! Power to the people! and all that. But in this here awkward reality, all the other needs we have, like food or housing, we are asked to pay for. So why not power? And asking people to pay for the opportunity to make power decisions with credits they ‘earned’ with plausible and useful judgments — is that too much to ask? + Hmm, It’s something to think about. As opposed to having them buy those positions — with real campaign money they asked us to chip in — as if they didn’t have enough money they scrounged off the profits they made from selling our work in the first place? – You are beginning to sound like some candidate, Sophie. Are you planning to run for something? Meanwhile: What’s the other aspect you were mentioning, Bog-Hubert ? * Right: First, let me ask you if this first idea isn’t one way to make people in power ‘accountable’: meaning that they have an account from which they put up some kind of security they’d lose if their decisions don’t work out. So the idea is this: depending on the importance of the decision: put up an amount of your credit points you are willing to bet on the success of that decision, and as a ticket for being such an important person. If it works out, you may earn more credits; if it doesn’t, you lose those credits you put up. And if you have gambled away all your credits on foolish decisions, step aside. So isn’t this scheme another — innovative and, I’d say much needed — way to control power?Not a complete panacea, of course, but then our traditional means of power control don’t seem to be working too well anymore: there’s work to do on that issue, I think. Some different thinking? * Yes, yes, I know, Sophie: about the second point. It also has to do with accountability. But this is about the accountability of the supporters of candidates and people in power positions. Consider that, as a form of support for a candidate, people might transfer some of their own credits to a candidate’s campaign, or to a person in a power position. Instead of money that currently is just used to buy expensive repetitions of inane campaign slogans and mudslinging accusations of competitors, your transferred credit points ’empower’ the candidate with your confidence in her or his judgment. If the person starts making stupid judgments, you can withdraw your contributions before losing them all to the Caligula-infected schemes of leaders whose power has actually made them sick, poisoned their judgment. In a sense, you ‘invest’ your precious credits, your own reputation, in the candidate’s future judgment. If the decisions work out, the candidate may pay you some ‘dividends’ on your investment. If the decisions flop, you lose it. Not only the official. It makes you accountable as well. * I’ll second that. I can see you guys aren’t quite ready for this kind of creative thinking yet. But just let me ask you this: For those issues we mentioned: getting people to participate meaningfully in planning decision discourse, rewarding them for meaningful contributions, not for uninformed rehashing of others lies; for making decisions based on the merit of discourse contributions, for evaluating that merit in the first place, for reducing the role of money in politics, for developing better controls of power: do you have better schemes up your sleeves? Then let’s hear them. Cheers, by Abbé Boulah! The idea of an unconditional basic income looks like a good idea – a plausible extension of the common concept of life-supporting infrastructure — roads, communication, water supply, sanitation, police protection, defense are all part of that concept of providing essential conditions for all citizens. One of the most frequent arguments is that such a guaranteed basic income would replace dozens of other support programs with their expensive and dignity-destroying bureaucracy, and provide recipients ‘freedom’ to allocate their funds in the way that corresponds best to their different individual needs, and pursue their own creative preferences. The obvious question of how it would be financed is usually brushed off with that comment on savings from replacement of those programs, and seems to shut off further questions – as well as further investigation and discussion. Since the devil often hides in the details of such noble endeavors, it seems necessary to look at some of those questions that aren’t being discussed. At the risk of oversimplification, would it be useful to start with some basic assumptions and a very simple diagram of the main aspects, and their specific implications? One assumption is that such a Basic Income should be sufficient to support a citizen’s needs for living a reasonably dignified life, providing the essential means for shelter, nourishment, clothing, health care, education, and so on. It should represent an adequate ‘life support’ package of life in a civilized society. Obviously, determining the size of such an income will require some investigation and discussion; it seems that it will not be easy to settle upon one size that will adequately but not extravagantly support residents in all locations, climates, and life situations. But some analysis of basic provisions for such a program it can be assumed as settled somehow. Another assumption is that it should be ‘universal’ – that is, that all citizens should receive it regardless of their other economic or other situation. So some proposals – such as one providing the income for citizens over 21 years of age – already seem to twist that assumption somewhat. A somewhat obvious assumption is that this basic income cannot be taxed — it is indeed sometimes being described as a ‘negative income tax’. The obvious implication that it therefore must be financed out of government income from other sources – in an economy consisting only of the components of producing the ingredients of that basic life support bundle, but no further production of ‘luxury’ items that would not be attainable with that income, the government distributing the Basic Income would have to tax everybody’s entire Basic Income to run the program – or just print money, which would end up in the pockets of the producers, and irresponsibly cause unstoppable inflation. But this raises the question of what items should be considered as ‘luxury’ and therefore taxed to supply the revenues for the UBI. 4) An element that might be called ‘Distribution’ – ‘D’ — (it might also be just a ‘machine’; but it is necessary to assume such an institution or ‘market’ where the actual products of the life support package LS can be exchanged for the money of the UBI (and vice versa). 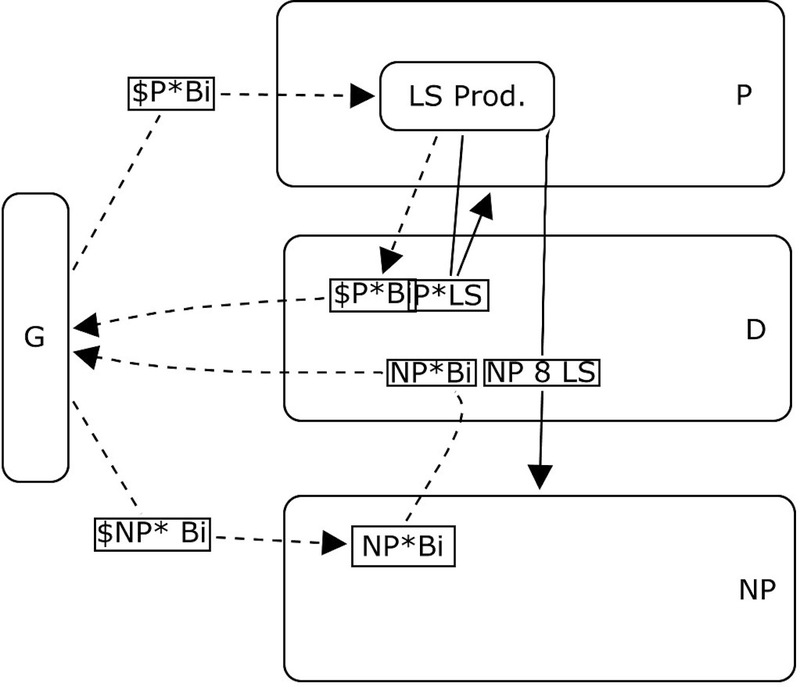 Figure 1 UBI ‘self-financed’ with only LS production? Having receiving $P*Bi from the government, this sum is transferred to D in return for P*LS life support packages (the content of individual packages may differ according to people’s different preferences) but the entire package is P*LS and ‘worth’ $P*Bi; so P’s are ‘paying’ $P*Bi to the distributor D. The P population ‘consumes’ P packages of LS. NP are receiving $NP*Bi from the government and buy NP*LS worth this much from D, so transferring that sum to D. This part of society ‘consumes’ NP units of LS. G To be able to pay out the next ‘round’ of Bi payments, the Government must receive the sums $P*Bi + $NP*Bi back from the Distributor D.
So far, so good; this ‘system’ seems to be ‘sustainable’. But is it? What, if anything, is P getting for producing all the life support packages? Just the amount needed for the P people involved in production to stay alive — $P*Bi? The UBI proponents will argue that the UBI can’t be financed (as the scheme of Fig. 1 does) from the UBI payments: it must come from the production and payments of goods and services NOT in the LS package description: ‘luxury’ items ‘LX’. If the assumption is to be satisfied that the whole UBI scheme must be financed from the ‘luxury’ items part of the economy, this will determine the total amount of payments—and thus the price of the luxury items – involved in this sector: For the scheme to be viable under the stated assumption, the sum (LX ‘taxes’) to be paid to the government must equal (at least) $ (P+NP)*Bi – regardless of the size of this sector, the number and quality of luxury items produced and sold. Question: How can the UBI-mandated price of a luxury item be established / predicted based on how much it will contribute to the needed government UBI Payments? This seems to fly in the face of standard views of economics, such as that the price for a good or service should be determined by the cost of producing it, a reasonable profit margin, and from then on by demand. I am sure these and similar questions can be answered by better qualified experts. For example, the overall problem that the viable financing of the UBI system will be inexorably linked to the ratio of P to NP – which is likely to change over time – and therefore likely demand adjustments to those changes even in the amount of UBI payment the government can ‘afford’? or in the purchasing value of those payments – in violation of the ‘guaranteed’ part of the BIG promise of ‘Basic Income Guarantee’? I’d like to see the proponents of the idea spend some effort in answering these admittedly annoying little detail questions – even to the public who may not have had the chance to review any more detailed proposals than the PR propaganda pieces focusing only on the main ‘reduce government’ and similar arguments. Including questions I have blanked out from this little inquiry: the issue of the resources going into the production of all these goods and services, the question of different amounts of time, skills, education etc. to produce them, and the role of the entire ‘distribution’ segment, including transportation, interim financing, advertising, and selling, the aspect of ‘consumed’ goods (e.g. food’) as opposed to durable goods (houses), and the whole wicked issue of insurance to deal with randomly occurring needs whose costs exceed anybody’s ability to pay for them out of an UBI Payment. It seems that the public discussion of this concept has not covered all pertinent issues yet. While such detailed explanation is possible and conceptually not overly challenging, including this process in actual decision-making procedures would add cumbersome provisions to a planning discourse already calling for more structure than many participants are used to and feel comfortable with. The issues of ‘aggregation’ – of individuals’ partial judgments into overall judgments, and especially of individual judgments into ‘group’ evaluation measures are potential sources of controversy. It becomes clear that any overall ‘measures’ or judgments that can meaningfully guide decisions cannot be derived in ‘top-down’ fashion from general ‘meta values’ and ‘common good’ concepts but must be constructed ‘bottom-up’ from individual participants’ concerns and understanding of specific situations and context. Familiar claims of planning decision makers ‘to act on behalf of others (clients, users), with adequate knowledge of those others’ concerns and basis of judgment, but not having gone to the trouble of doing this, are unfounded and should be viewed with reserve. Examination of criterion functions make it obvious that the quest for and claim of having found ‘optimal’ solutions is unrealistic: no plan will achieve the ‘best possible’ scores on all evaluation aspects even for individuals, and different people will have very different but legitimate criterion functions. Considering plans or policies whose effects will occur – and change – over time, adds another level of complexity. System simulation models can track the performance of variables (criteria) over time, but do not show associated ‘goodness’ judgments (obviously, since this would either be just one person’s assessment, of some aggregated measure of judgments that have not been included in the system modeler’s data. The examination of how evaluation judgments for different plans could be tracked over time (as a function of the simulated variable tracks) suggests a different decision guide: the (time-discounted) degree of improvement of a plan over the current or predicted problem situation under the ‘do nothing’ option. The discussion takes place in the hypothetical ‘Fog Island Tavern’. – Hey Bog-Hubert – what kind of critters are you guys talking about? I couldn’t quite get it coming in, but it sounds like serious wildlife? – Good morning Renfroe. Well, I guess you could call them critters, but not the kind you mean. Actually, we were talking about criterion functions. About how we can explain what we mean when we’re making judgments about, say, proposed plans. Calling them good, so-so, or bad, or anything in-between. – Huh. Plans, as in what to do about saving the beaches where each storm washes away more of the sand? – Yes, or about what to do about the climate change that makes the storms worse and the oceans rise. – What, you guys can’t even come up with a plan for beach preservation on this little island, and now you want to talk about the oceans and global climate? – Well, Renfroe, it looks like the problems of coming to some agreements about what to do are the same everywhere, just at a different scale. – So where do your critters come in on that one? – I guess we need to back track a little on that. It has to do with evaluation, say of different proposed plans, to decide which one is best, or whether any of them should be implemented. You could start by looking at them and then make an offhand judgment, say ‘good’; ‘not good’. If there are several proposals, you may want to use a more detailed scale, for example one with seven points ranging from ‘couldn’t be worse = – 3, to ‘couldn’t be better’: +3, with a midpoint of zero meaning ‘don’t know’ or ‘so-so’. In a group you’ll have to agree on some common scale. Now somebody asks you why you rate proposal X so high, and solution Y so low, since they came up with very different ratings from yours. So you may want to talk about the reasons, the basis of your judgments, maybe you each know something the other doesn’t know or see, that should be considered in making the decision. What do you do? How do you explain what makes a solution good or bad, in your view? – Well, you could look at the various costs and benefits, and how well the plan will work for what it is meant to do? – And how good it looks, if its’ a building or some thing we are looking at or living in? – And don’t we also have to worry about those ‘unexpected side-and-after-effects’ of plans, that people always talk about but keep forgetting? – Good point. Next we list all those considerations or ‘aspects’ and make sure that we all mean the same thing when we name them. But we can only consider what people bring up in the discourse, so it’s important to make sure that is organized so as to let everybody put in their views. Now you can give each plan a ‘goodness’ judgment score – on the same scale — for each of those aspects. Let’s call those ‘partial’ judgments – all together they make up your ‘overall’, whole judgment for each plan. You’ll then have to explain how exactly all of those scores make up the overall judgment. – And looking at the different aspects, you may want to reconsider the first overall, offhand judgment you made? – Good point, Vodçek. Deliberating already. Learning. Excellent. But to get to the criterion functions: You realize how an explanation of a judgment the goodness score always consists of showing how the judgment relates to something else. That something else can be another judgment – look at how Sophie suggested that her overall ‘goodness’ judgment of, say, a building, should depend in part on the beauty of that building – which of course would be another judgment, and people may have different opinions about that. But the relationship would be that of some ‘degree of beauty’ about which she would have to make another ‘goodness’ judgment to explain how it contributes to the overall building goodness judgment. – That’s not much on an explanation though, is it? – Right. So you could ask her what, in her mind, makes a building beautiful. What would be you answer, Sophie? – Well, if I got the sense that he just wants to annoy me with all these questions – because I can see how each answer will just lead to another one, and where will that end – I could just say that if he can’t see it he just doesn’t understand beauty and tell him to get lost. But if I think he really wants to learn what I see as beautiful, I might suggest that it has to do with, say, its proportions. – Hey, didn’t we look at that proportion thing a while back? But then we looked at both sides on the 1:1 point – if the right side is for ‘vertical’ rectangles, the left one continues past the 1:1 point for horizontal ones. – And if I remember correctly, didn’t somebody point out that there are many people who feel that the square, or the one based on the diagonal of the square, the √2 relationship, is the most beautiful proportion? – You’re right. But that was in another book, a fat one, if I recall? So let’s not get too distracted by the details here. But perhaps we should just remember that there are many different forms of such functions: the one where ‘zero’ on the variable represents -3 on the judgment scale, which goes on to approach +3 at infinity, its opposite that starts with +3 at zero on the criterion scale and approaches -3 at infinity, the opposite of the golden ratio curve that goes from -3 at some value of our criterion and rises towards +3 on both sides. – Can’t think of an example for that one though. Except perhaps weird ones like people’s appreciation for apartment levels going up towards the higher floors and +3 at the penthouse – but with a sudden drop to -3 at floor 13? – Goes to show that people’s preferences can take strange contortions… But those are personal judgments. I guess they are entitled to hold those, privately. Now, what about collective decisions? – Yes, Vodçek. That is the point where we left off when Renfroe came in. We can explain how our subjective goodness judgment relates to some objective measurement. And this is useful: I can ask somebody to make a decision on my behalf if I give him my criterion function to make a selection – even though I know that his criterion function likely has a different shape and the high +3 judgment score is in a different place. But the issue we started from was the idea that there should be measurements – expressing values – that everybody should agree on, so that collective decisions could be guided by those values and measurements. ‘Meta-values’? – Yes, that notion seems to make perfect sense to many people – for example the feel that trying to stop climate change is so important for the survival of human civilization – that it is such a meta-value that everybody should agree on so that we can start taking more effective action. And that this is even an ethical, a moral duty. So they can’t understand why there are some people who don’t agree. – Right. So we were trying to untangle the possible reasons why they don’t. – Short of declaring them all just blindly indoctrinated by political or religious views or outright fraudulent misrepresentations, eh? – Yes, let’s not go there. I guess there may have been some confusion because at first there was no distinction between the ‘meta-values – that were quite general and abstract – and the corresponding measures one would need to actually guide decisions: You can’t really argue against a concept like the Common Good as a guiding value – but when it comes to pin down just what that common good is, and how to get an ‘objective’ measure for it, history shows that there’s plenty of disagreement both about the ‘common’ part – my family, tribe, town, country, my religion, humanity, all life on the planet? And even more vicious: about the part what the ‘good’ might be. – I agree; and the attempt to justify those different views have led to some pretty desperate contortions of moral guidelines for decisions to meet those good things: I remember the old ‘dulce et decorum est pro patria mori’ (‘sweet and decorous it is to die for one’s country’), or promising all kinds of heavenly rewards in the hereafter to those willing to fight and kill and die for religious ideas. – Well, if your tribe or country or your faith is your ‘common’, and somebody is attacking it, what’s wrong with that? – I guess it becomes questionable when these definitions lead to more of the good is ending up with some people – the fellows who are spouting these glorious quotes and values and then get to make the decisions ‘on behalf’ of everybody else, while many of the everybody else are doing the dying and sacrificing. If it becomes apparent that these value leaders and doers have actually been acting more on behalf of their own good, the trust in those values is eroded. No matter how they are justified: by philosophical theories, by divine revelations (mostly revealed only to some special prophets), by political theories, or scientific theories. Or systems thinking. Or holistic thinking and awareness. – Even scientific and systemic investigations? Well: unless they can also offer guarantees that those leaders are not just acting on their own behalf. Even if Congress were full of scientists and systems thinkers: if they make laws to deprive people of health insurance while themselves enjoying the best insurance and health care, no matter what justification they offer for their actions, they would run into trust problems. So that would be one condition. – One condition, Vodçek? Are there others? – In theory, yes. Its’ actually part of the job of the legislature: isn’t it in the constitution, even, that they should make laws on behalf of their constituents. And the representative notion is, of course, that representatives should be part of the communities they represent and communicate with then so that they know what the community wants? And then go and vote for laws that realize those preferences. – Which they should do even if they don’t agree with them? Even if they know better? Doesn’t the constitution also state that they should vote according to their own conscience? – Right: there seems to be some contradiction there. And it’s leading to that constant tug-of-war between the principle of electing representatives whose judgment we trust — to vote in view of the common good – even if we don’t agree, — because we don’t have all the information? Or because we are suffering from doctrinaire blindness or stupidity, or ethical or moral depravity? And to the alternative of passing laws by referendum, regardless of what the representatives are saying. – Well, there’s the practical issue: we can’t possibly make all laws by referendum, can we? And if we are too ignorant to give our representatives proper guidance about how to vote so they have to vote by their own better knowledge and information and conscience, should we be allowed to vote on laws? – But we are allowed to vote for the representatives? Isn’t there an expectation that the representatives should provide enough information to their constituents to know and understand the best available basis of judgment for the needed actions and also be confident that the representatives’ basis of judgment is sound enough to let them vote according to their own judgment conscience if and when necessary? – Right. Theory, perhaps; current practice of governance looks a bit different. But that’s where our question about the criterion functions come in, again: They are part of the process of not only making up our minds about what actions to take or to support, but also of explaining our basis of judgment to each other. In the extreme, so that we can trust somebody else to make judgments and take action on our behalf – because we have conveyed our mutual basis of judgment well enough, as well as made sure it does give adequate consideration to all available information and concerns. – So what we are trying to clear up for ourselves is this question: Are there general or universal ‘meta-values’ that can give us adequate criteria to guide effective action — not only let leaders invoke those values without an way of checking whether they actually are served by the proposed actions? And how would those criteria / measures come to be identified and agreed upon? – Even more specifically, whether those measures should be determined by objective measurement, and then used by some people who are able or entitled to initiate ‘effective action’ to not only do so, — on behalf of everybody else – but to claim that this is ethically and morally defensible and necessary. – And to declare everybody who disagrees to be ethically misguided – really: to be ‘bad’ or ‘evil’ people. – Do they come right out and say so? – I think both sides are, in so many words, unfortunately. So the question of whether there are ‘meta-values’ with related performance measures that everybody should adopt and thus support the resulting actions, is an important one. The sticking part being, to support collective actions taken on our behalf, and perhaps compelling us to take certain everyday actions ourselves, in pursuit of those meta-values. Didn’t we say, a little while ago, that somebody can take action on my behalf if I have given him my criterion functions? – But now it looks like the suggestion is the other way around: that there are criterion functions people tell us we should adopt, to comply with the ethical demands of the Meta Values. So we are trying to understand what that really means. – Okay: so, let us assume that we have persuaded the participants in the climate change debate to explain their basis of judgment to each other, as much as possible by use of criterion functions. Diagrams that explain how or subjective ‘goodness’ judgments g about proposed plans relate to some ‘objective’, measurable properties of climate change aspects. Take the example of the ‘evil’ CO2 that we are adding to the atmosphere. Assuming that there is some agreement about how much that matters – a different scientific question that also needs sorting out in many people’s minds. And assuming there’s some meaningful agreement about how and where those levels of CO2 will be measured. – What do you mean – are agreements about CO2 needed? Isn’t that just a simple scientific fact? – No, Sophie: It makes a difference whether you measure CO2 content in the atmosphere, and at what height, or in the oceans. All those things must be sorted out. Then: is the ‘amount’ or ‘percentage’ of CO2 a good choice of criterion for explaining our judgments about the quality of a plan to improve things? It shows their different judgment basis regarding what that level c* should be, showing the CO2-measure on the x-axis and the judgment score on the y-axis. Any lower or higher than that would get a lower score. – Okay; I see. And you are saying that in principle, every participant in the evaluation would be entitled to his or her own curve? Even one that doesn’t have the highest score at ‘c*’? – Now why would you – or anybody – put the highest score anywhere else? – Well, aren’t you guys saying that having spewed so much CO2 into the atmosphere since it was at that benign level ‘c*’ has done a lot of damage already? So to repair that damage – to get the glaciers to grow back, for example, or to cool down the oceans, – it would be necessary to reduce the CO2 to a lower level than ‘c*’ – at least for a while? If you could calculate that level, that’s where a person B might put the +3 score. And give that score to another plan P2 that would achieve that level. Does that make sense? – Wait a minute: wouldn’t it be better to look at the effectiveness of a plan to reduce the amount of CO2 – at least, as you say, for a while, until the effects of increased CO2 level have been ‘repaired’? – Good question, at least for showing that even the choice of criterion is a controversial issue. You could say that it might be even better to look at how close to the ideal CO2 level a plan can get with its reduction effectiveness, and show how that relates to what would happen if nothing is done? Which is always an alternative ‘plan’? – Good. But the question is really about whether the criterion of ‘c*’ or ‘c•’ is an appropriate one to base you judgment upon: Both plans are claiming to reach those values – claims that should be assessed for their plausibility, don’t forget – but at different points in time. So which one is ‘better’? – I guess we should say: the plan that gets there ‘sooner’ – all other aspects being equal, for the sake of the argument. – Yes, but doesn’t that mean you really have a different criterion? Specifically: the criterion of ‘time for the plan to get to c* — or c•? Which really is a different criterion, so which one are you going to use? – Does it matter whether we use different levels of desirable c’s as long as we all come up with a goodness judgment g, and we each have explained what that judgment depends upon? – If the outcome is that your judgment will support P1 while –‘s score will prefer P2 as the better plan – all else being equal, as you say: the problem isn’t really solved yet, is it? and to the plan alternative of ‘doing nothing’. – Hey guys, aren’t you missing something essential here? Well, you did sort of stumble on it, – with your remark ‘at least for a while’. – Huh? Explain, Vodçek. What’s missing? – Time, of course. 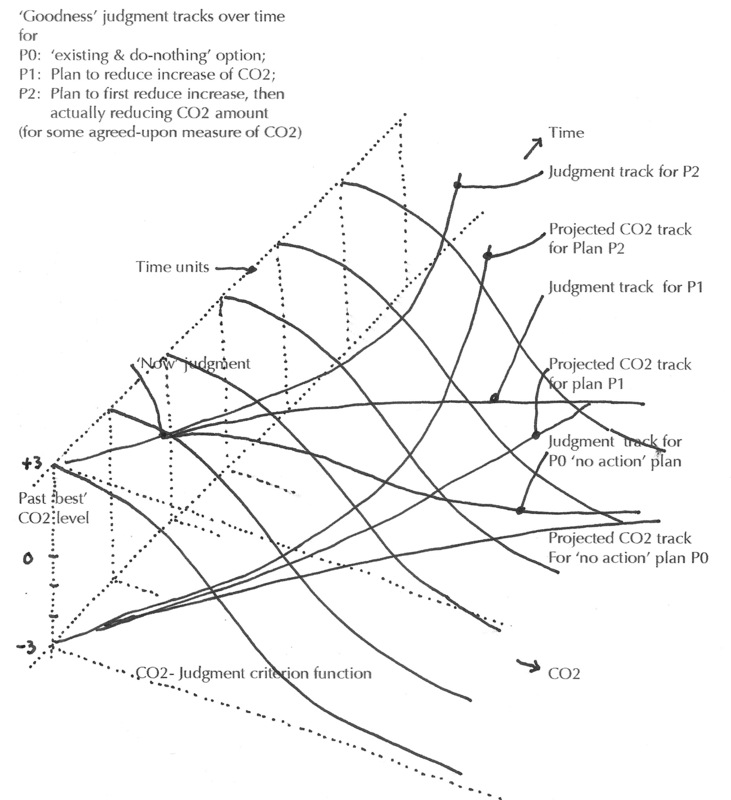 In your criterion functions so far, you seem to make an assumption that your plans P1 and P2 will somehow ‘achieve’ some level of CO2 one they got implemented, and that things would then stay that way? But come on, that’s not how things work, is it? Even a plan for this kind of issue would have to involve activities, policies, processes, all continuing over time. It can’t be a sudden magic spell to change things overnight. And then it would take time for the actual CO2 level to change back to whatever level you’d have in mind — if the plan works. But how long is that going to take? And is it going to stay at that level? Shouldn’t that be part of your systemic ‘due consideration’? – You are right. So let me see – looks like we have to draw up a kind of three-dimensional criterion function, is that what you are implying? – Okay, I see your point. So we draw the diagram like this: Time on the horizontal right-left axis, CO2 – level on the horizontal up-down axis y, and your judgment on the vertical axis z. – But now, what’s your score for those plans? If the CO2 levels and judgments change all the time? By the way, wouldn’t you have to also include a simulated track for the ‘current’ state of affairs and its future track if nothing is done? + Right. So we have the time CO2 simulation with three tracks – like this? – Okay, what about instead looking at the difference between the desired targets and what the plans are actually achieving, over time? It would require looking at the total measure of those differences over time, and I agree that it would also require an agreement about the time frame we are willing to look at. People keep talking about the world we are going to leave for our grandchildren, from a more systemic and holistic perspective – but don’t offer any specifics about how we might distinguish one plan from another, or even from just doing nothing? – I like your point about looking at the difference, the degree of improvement we can expect from a plan. What would that look like in your diagram? – Well, the measure would have to be one like the area of the judgment ‘surface’ between two alternatives? Because we agree that in order to reach some kind of meaningful overall measure, it will have to be made up of judgment’ measures, right? But I’m sure that at least for individual judgment systems, ways can be found to calculate that, just as there are equations that describe the simple line functions in the previous examples. But for the time assessment, it will have to include some feature of ‘discounting’ the judgments over time – like calculating the ‘present’ value of a series of income or cost payments over time. Work to do, eh? 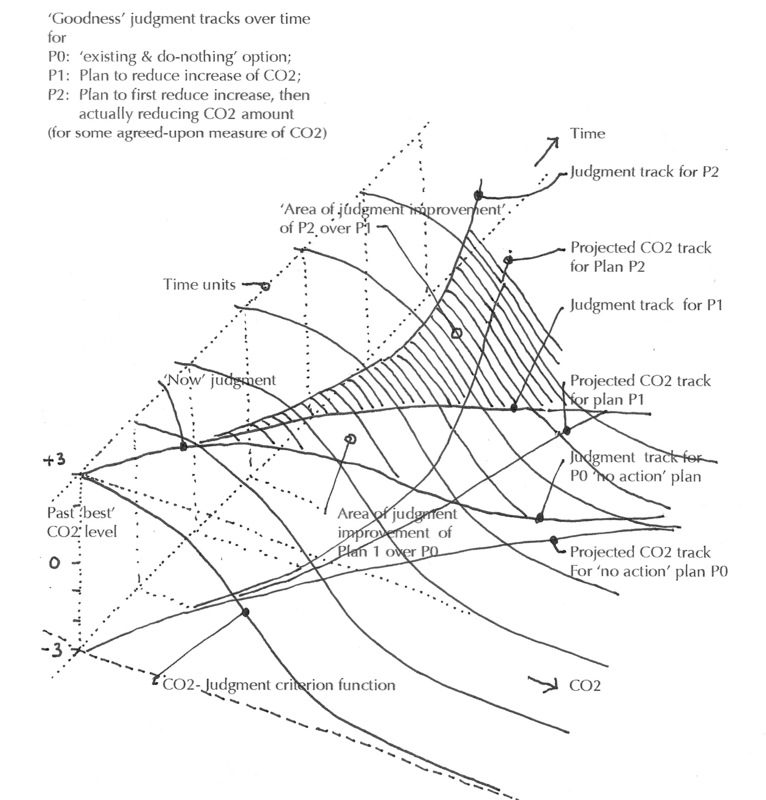 Because you can see in the diagram that if a plan ‘works’, the improvement judgment area will get wider and wider over time – but after since the probabilities / plausibility judgments will also get more and more uncertain for long future time periods, they will become less and less important factors in the final overall judgment. – I see what you mean. Not because we don’t care about future generations, mind you – but simply because we just can’t be certain about our predictions about the future. – Right. Meanwhile, the discourse may become more productive if we threw more of these kinds of diagrams into the fray? Like this one about the judgment surfaces – I agree it needs discussion? – So you may have to look at the actual results that those changes in CO2 will bring about, over time? Like: levels of ocean rise expected until the remedy sets in – will it actually recede if the plans are any good? I haven’t heard anybody even mention that yet… And provisions for what to do about sea level change until it stops rising? – Coming to think of that – have there been any plans put out there with that kind of details? – I admit, I haven’t been following all the reports on that controversy – but I am not aware of any. – Hey, here’s a test for promoters of a plan: ask them whether they are willing to put up down payments for new ocean front real estate that will emerge if their plan works as intended? – Renfroe… Ah well, maybe you’ve got something there. Get Al to put down money for property on the beach in front of Mar-a-Lago? – You guys are giving me a headache. How are we ever going to get moving on the problem if you keep analyzing things to death and wasting time with stupid pranks? – Well, who was claiming and boasting about taking a more systemic and holistic look at these problems, and of making decisions based on objective facts? It may be useful to turn that big talk down a notch, and focus on the painful nitty-gritty aspects of how to make these decisions. So that people can agree on something specific instead of calling each other names, and resisting plans because of distrust – deserved or not – about what the promoters for plan P1 or P2 are really after? Like power? The next election? More profit for one industry rather than another? That lack of trust may be the real reason why people keep resisting plans to do something about problems. But can’t talk about them because those suspected motives or their lack of them aren’t being part of the discourse? – Ah: the discourse. Yes. How to talk about all that without starting to call each other names or throwing rocks at each other and storefronts… What does that take? Where’s Abbé Boulah?